Vikam's Kadaram Kondan is all set for release from 31 May. The movie is directed by Rajesh M Selva of Thoongaa Vanam fame and produced by Kamal Hassan under Raaj Kamal Films International and Tridents Arts. Akshara Haasan plays the female lead in it. Music for the movie is by Ghibran. A major portion of the movie was shot in Malaysia. 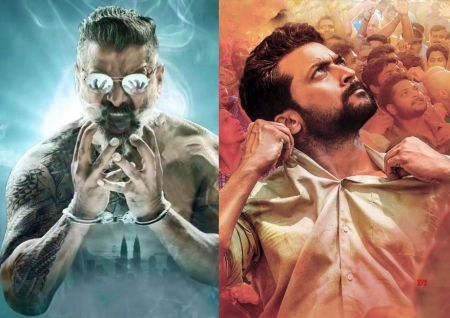 The big news is that on the same day release Suriya starrer NGK directed by Selvaraghavan. It would mean a cracker of contest at the box office. NGK is a political thriller and it features Sai Pallavi, Rakul Preet as heroine's. Music I'd by Yuvan Shankar Raja.